Miguel Perez, Doney Bedford, and Christopher Murgatroyd - all inmates at the Land O' Lakes Detention Center show off the tablets the jail received last week. In the veterans and faith-based pod at the Land O’ Lakes Detention Center, inmate and Army veteran Christopher Murgatroyd, 31, scrolls through the Kahn Academy app on a Google Nexus 7 tablet. He’s been glued to the history lessons through the Kahn Academy app since getting access to the tablet last Thursday. 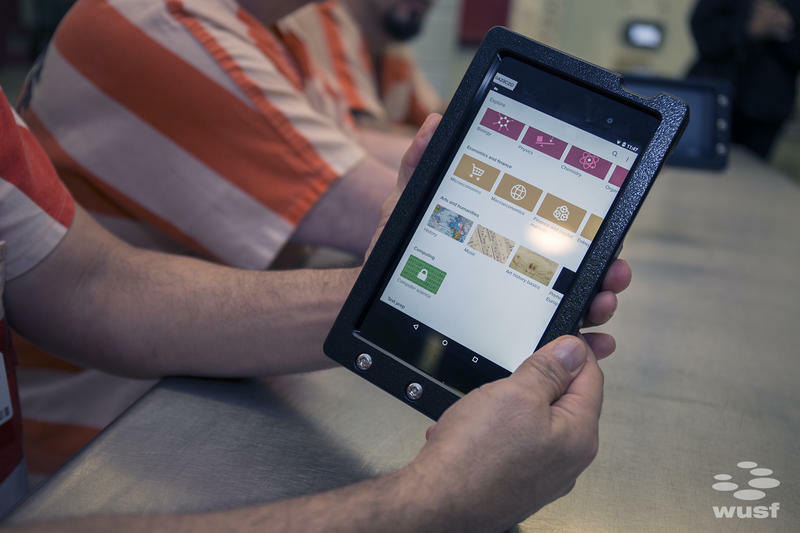 Pasco County has joined Walton, Duval and Flagler counties in offering inmates use of tablets during their free time. More than 200 Google Nexus 7 tablets were donated to the Land O' Lakes Detention Center recently by the inmate communications company Telmate. Pasco County Sheriff Chris Nocco said some might question why they’re giving inmates tablets when they’re behind bars for committing crimes. He stressed that education is important in helping people avoid future incarceration. Nocco also said the tablets save taxpayer dollars because a law app allows inmates to look up statutes for their cases. Before, jail staff would have to look them up and print out information. A professional tree trimmer by trade, Murgatroyd is here for driving on a suspended license and first time DUI. He said tension between inmates has lessened since the tablets came. They take turns logging into the tablets – there is one for every eight inmates – using facial recognition software and a unique passcode assigned to each person. They get 10 minutes at a time to use apps, like the Kahn Academy, to help with GED and college prep. The "Calm” app helps inmates through anxiety, substance abuse and emotional trauma. There are even faith-based apps with the full text of the Bible and Quran. The tablets are not connected to the Internet, but inmates may get access to email in the future. “I’ve been to the MOMA [Museum of Modern Art] in New York like eight times,” Murgatroyd. And when he isn’t visiting museums or studying ancient Roman history – his favorite time period – he’s using the Calm app’s breathing exercises to help him through PTSD. “It helps my anxiety levels,” Murgatroyd. He spent six months in Kuwait, then time in Afghanistan and Iraq. He’s not fond of talking about it, so he appreciates the app. In the future, he hopes the tablets will allow access to Veteran’s Affairs resources. Some of the inmates are even inspired to take their education further once they’re out of jail. Doney Bedford, 46, is awaiting trial for drug possession. But when he’s out, he wants to pursue a degree in theology. His favorite app? Bible Gateway. Miguel Perez, 53, who is awaiting trial at the detention center on accusations of fraud, agrees. He said the micro and macroeconomics lessons keep him occupied. “Instead of wasting time playing cars or doing nothing -- just walking around moping -- you can actually do something with your mind and your life,” Perez said. 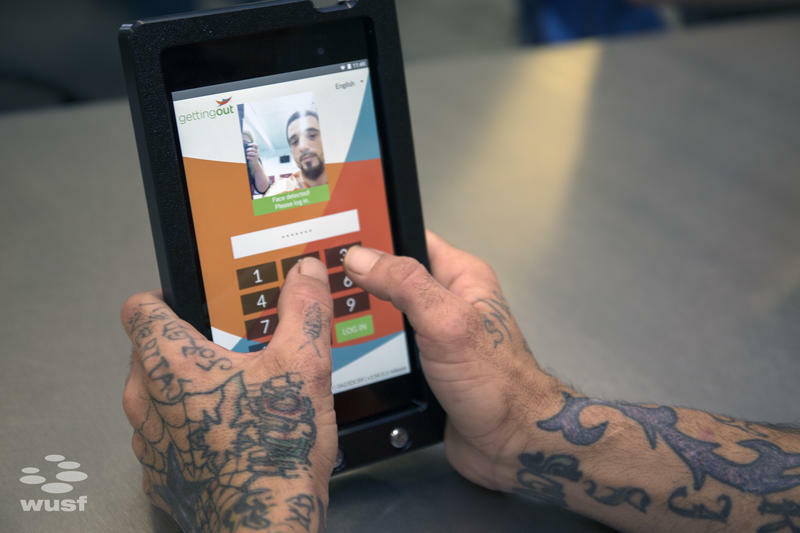 And if the inmates are interested in using the programs after they're released, most of the apps are available for download on any mobile device. 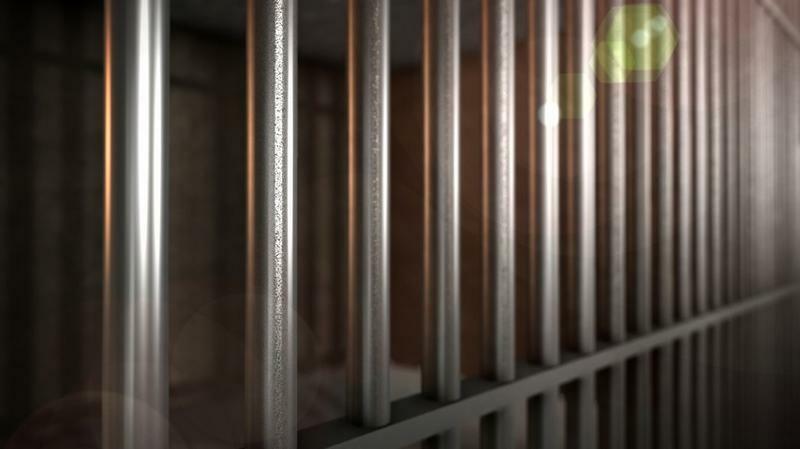 Governor Rick Scott has signed a bill into law meant to help Florida’s inmates.